6:30 a.m. to 12:30 p.m.
6:30 a.m. to 3:30 p.m.
understanding to preschool age children and toddlers. to music, academics to Bible stories, and everything in between. appropriate development level (age and stage). 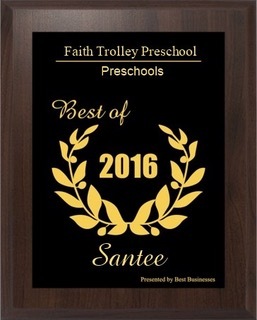 Santee School District and will prepare your child for their first year in school. as well as a hot lunch every day. A one time non-refundable registrationn fee of $80 is due upon enrollment. An annual materials fee of $100 is due every September for all children. fifth of each month. A 10% discount is offered for siblings.